Our special recipe of spring rolls stuffed with prawns, crabmeat, vermicelli, shiitake mushrooms, and egg, Served with homemade pickled plum sauce. 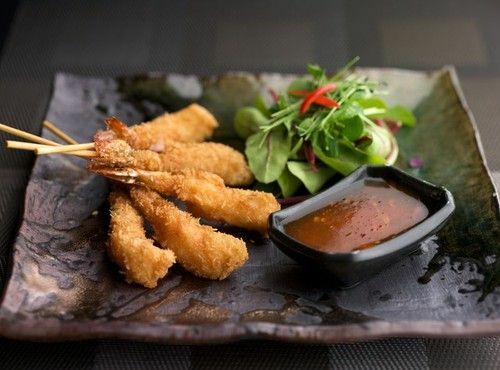 Deep fried rock shrimps in tempura batter, served with homemade plum sauce. 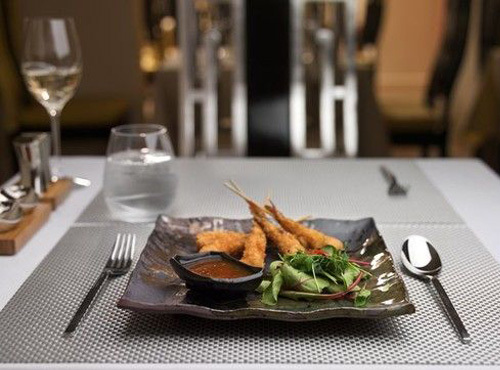 Special deep-fried king prawns coated with coconut, served with homemade plum sauce. 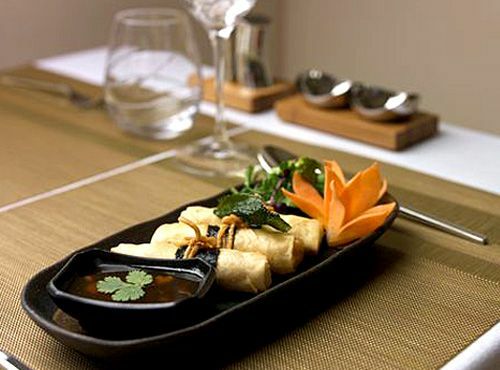 Traditional Thai dim sum made from minced prawn and chicken, served topped with fragrant dark soy sauce. Thai specialty of marinated chicken skewed and char-grilled, served with homemade peanut sauce. 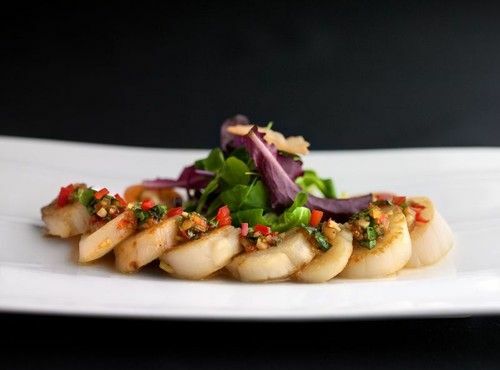 Tradition Thai contemporary recipe of grilled king scallops topped with chopped lemongrass, shallot, kaffir, lime leaves, mint, and chili sauce. Special egg sheet rolls; stuffed with BBQ pork, sticky rice, and pickled cucumber. 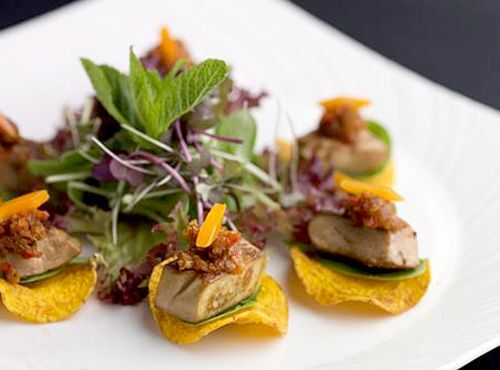 Pan-fried smoked duck breast, served with chili-tamarind sauce wrapped in small lettuce leaves. Our special recipe of deep-fried soft shell crab with sesame seeds, sprinkled with crispy egg. 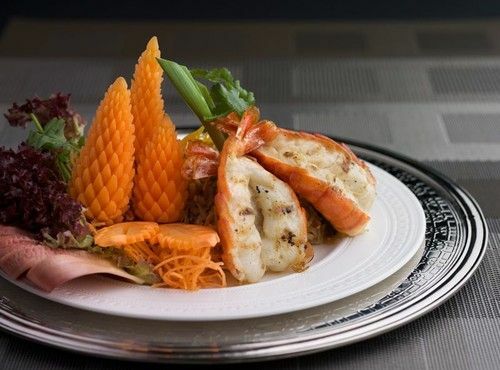 Tradition Thai recipe of minced prawn and chicken, simmered in palm sugar with deep fried shallots, garlic, peanuts. Served on man-darin and pineapple pieces. 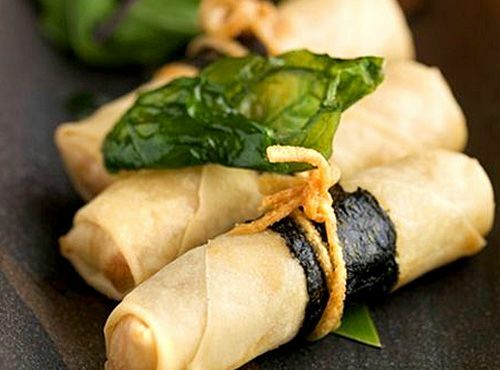 For groups of 2 or more, these are highly recommended as they allow each person to try a little bit of all the different tastes of vege-tables spring roll, prawn spring roll, chicken skewer, Thai dim sum and sweet corn cake, served with varieties of sauces. 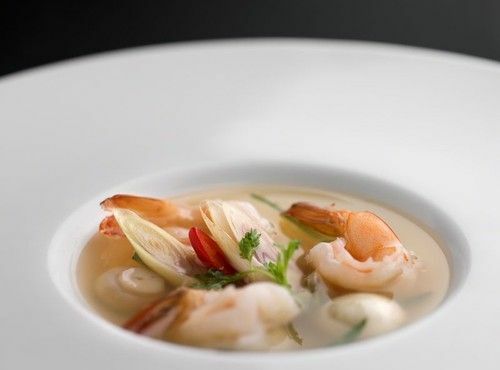 The famous Thai hot and sour clear soup with tiger prawns, mushrooms, lemongrass, galangal, kaffir lime leaves, and fresh chili. House special delicious Thai hot and sour soup with mushrooms, lemongrass, galangal, kaffir lime leaves, and fresh chili. Classic Thai coconut soup with chicken, ginger, mushroom, lemongrass, galangal, kaffir lime leaves, and fresh chilli. House special delicious Thai thick soup with crabmeat, sweet corn, carrot, shiitake mushroom, onion, and egg white. The popular northeast of Thailand salad with green papaya, chilli, garlic, fine bean, carrot, tomato, palm sugar, lime juice, tamarind juice, and fish sauce - topped with cashew nuts. A classic Thai salad dish; A varieties of different ingredients such as pork, shrimp, chicken breast and boiled egg with a mixture of vegetables and seasoning. 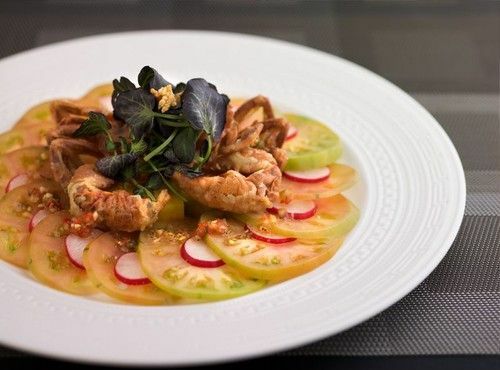 A refreshing salad of deep-fried soft shell crab with mango, grape, and chilli dressing. 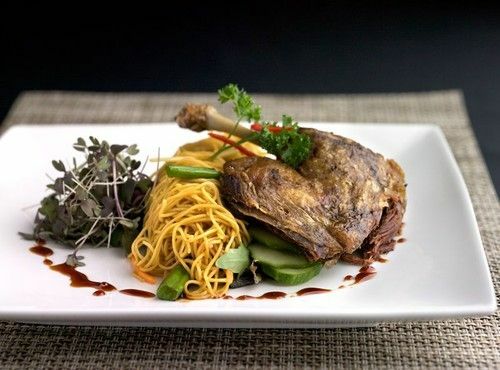 Special deep-fried aromatic duck served with baby leaves salad and chili, topped with olive balsamic vinegar dressing. 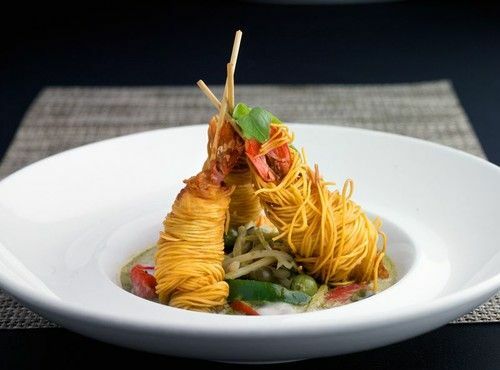 Deep fried green papaya with tempura batter; top with prawns, chili, garlic, fine bean, carrot, tomato, palm sugar, lime juice, tamarind juice, fish sauce, and cashew nuts. A classic Thai beef salad with grilled Scottish rib-eyed beef, tomato, sliced cucumber pieces, onions, spring onions, and celery. Mixed with chili and lime dressing. Famous Thai green curry cooked with coconut milk, sweet basil leaves, betal leaves, cha-om leaves, spinach, bamboo shoot, and red chilli with grilled marinated chicken. Thai green curry cooked with coconut milk, Thai aubergine, bamboo shoot, red pepper, green pepper, green apple, sweet basil leaves, and kaffir lime leaves with river king prawns. Famous Thai red curry with roasted pork, sweet basil leaves, betel leaves, cha-om leaves, red chilli, and coconut cream. 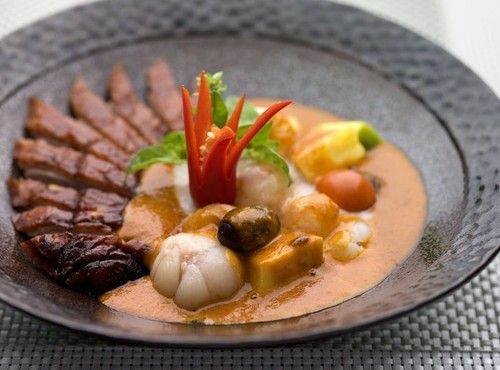 Special yellow curry with king scallops, mango, sweet potato, onion and coconut milk; garnish with crispy sweet potato. 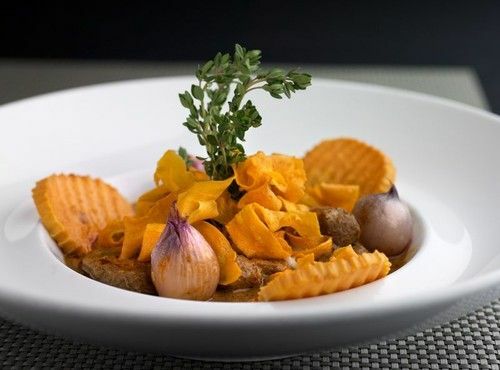 Slow-cooked diced lamb on massaman curry sauce simmered with sweet potato and onion , topped with cashew nuts and sweet potato chips. Special recipe of mild coconut curry with river king prawns, butter squash, sweet basil leaves, and our homemade shrimp paste. Our special recipe of roasted duck cooked with lychee, longan, pineapple, mango, grape, rambutan, mangosteen, and red curry sauce. 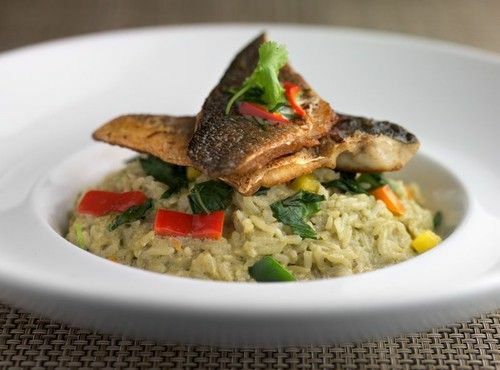 Famous Thai green curry fused with Italian risotto, topped with grilled marinated seabass; garnish with coconut cream, coriander, and red chilli. 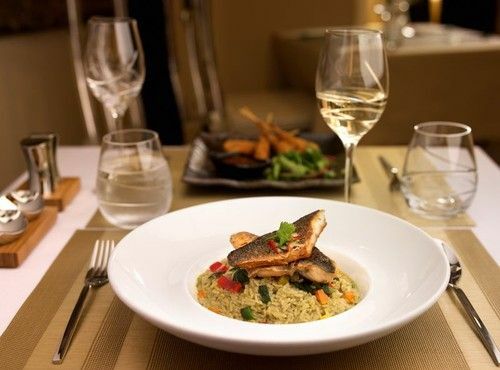 Famous Thai Tom Yum fused with Italian risotto. Cooked with mushroom, chili, lemongrass, galangal, kaffir-lime leaves, and coriander. Very hot and spicy Thai curry with Thai aubergines shredded bamboo shoot, baby corns, fine beans, broccoli, sliced carrots, red pepper, pepper corns, wild ginger, and holy basil leaves. 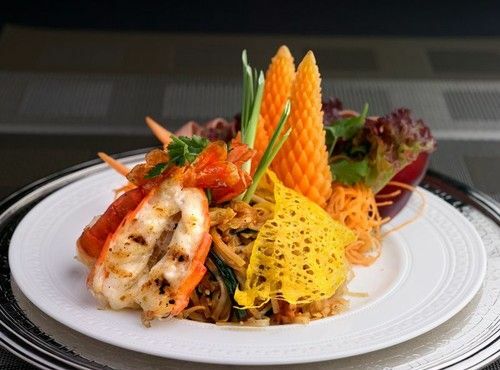 Classic Thai stir-fried rice noodles with river king prawn with our home-made Pad Thai sauce mixed with egg, bean sprouts, and chive leaves. 41. STIR-FRIED SPICY FLAT NOODLES (G) Stir-fried flat noodles with chicken, chili, carrot, mushroom, broccoli, cauliflower, mangetout, holy basil leaves, and egg. Stir-fried fresh egg noodles with shredded ginger, carrot, spring onion, Chinese leaves, and shiitake mushroom. Served with crispy duck and house special sauce. 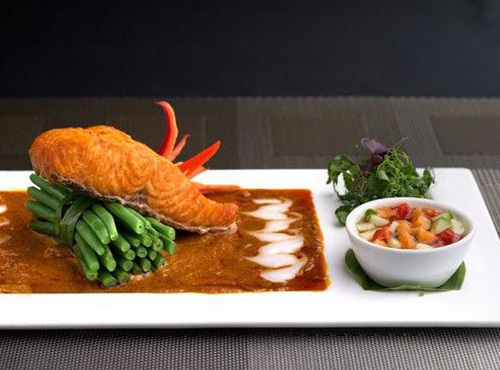 Our special recipe of deep fried seabass on the base of flat noodles and spinach, topped with oyster gravy sauce. Stir-fried of mixed seafood flavoured with chili, garlic, and holy basil leaves. Served with rice vermicelli. Stir-fried chicken with chili, garlic, holy basil leaves, shredded bamboo shoot, red pepper, and green pepper. 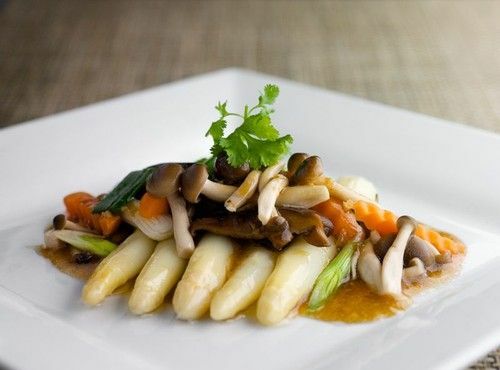 Famous stir-fried marinated chicken with cashew nuts, mushrooms, spring onion, onion, dried chili, pineapple, and water chestnut. 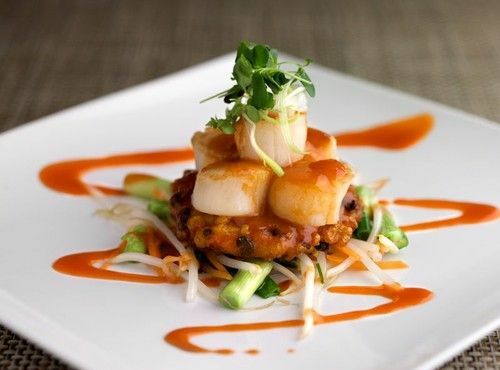 Char grilled blue river king prawn topped with tamarind sauce and crispy shallot on top. Stir-fried black tiger prawns with chili paste, spinach, sweet basil leaves, red chili, and garnish with crispy basil leaves on top. 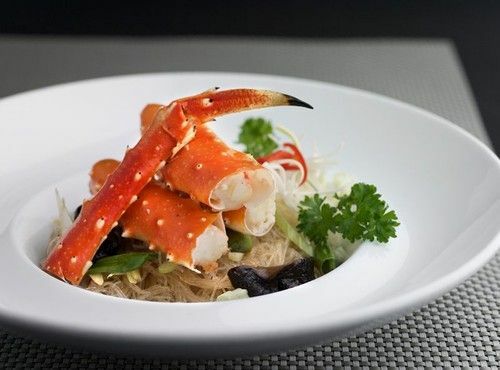 Our special recipe of Alaskan king crab leg stir-fried with creamy curry powder sauce, spring onion, egg, celery, red pepper, and green pepper. 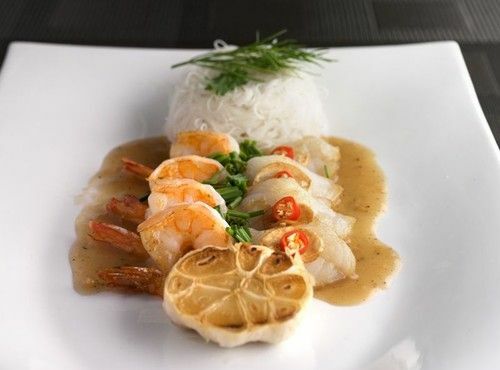 Special pan-fried monkfish and black tiger king prawns with coriander garlic butter sauce, served with rice vermicelli. Stir-fried minced chicken with chili, garlic, and holy basil leaves; topped with crispy soft shell crab. 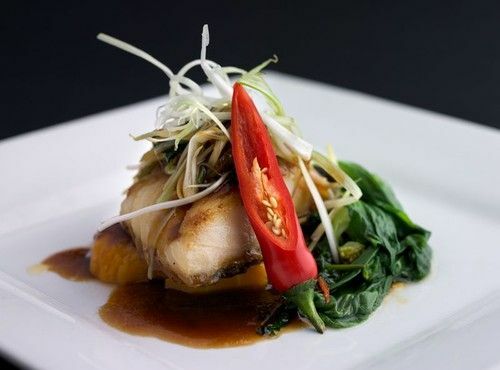 Char-grilled marinated halibut fillet with Thai herbs wrapped in banana leaves and served with chili lime dressing. 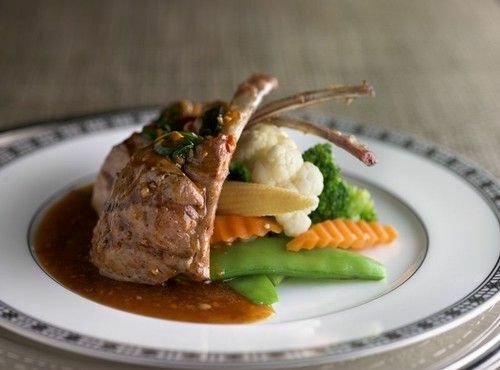 Char-grilled marinated pork flavoured with Thai lemongrass, honey, and special Thai herbs served with chef’s special sauce. Char-grilled sliced rib-eye steak, flamed with herbs sauce. 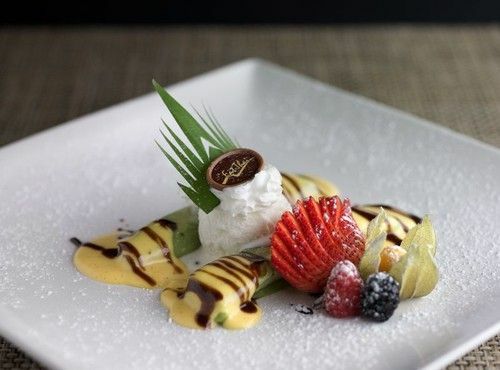 Served with chef’s special sauce. 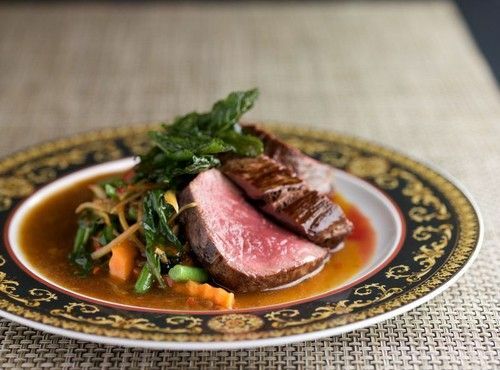 Grilled Angus Beef fillet with oyster sauce, spring onion, carrot, onion, and mushrooms. Wok fried slice of lamb fillets with wild ginger, green peppercorn, chili, baby corn, and sweet basil. Our special recipe of grilled black cod with caramelised honey sauce, accompanied with pickled ginger, and baby leaves salad. 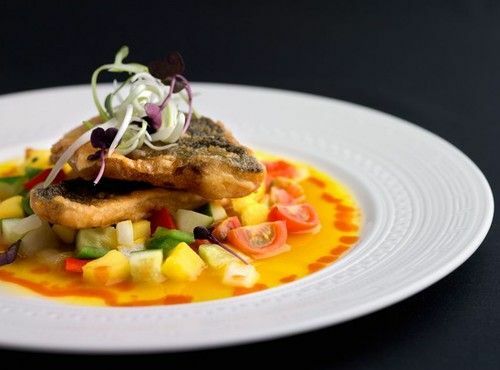 Special deep-fried fillet seabass top with sweet & sour mango sauce, spring onion, pineapple, tomato, cucumber, red pepper, and green pepper. 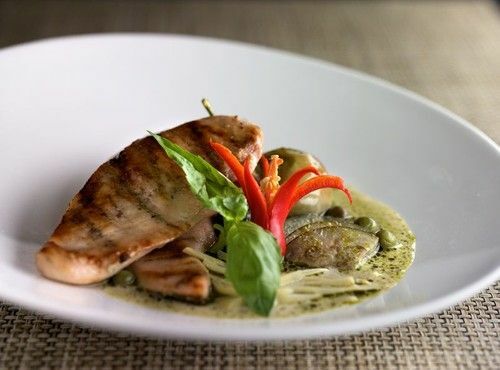 Special grilled smoked duck breast with green curry sauced, Thai aubergine, red chili, and sweet basil leaves. Our special recipe of stir fried slow cooked beef with young peppercorn, chili, garlic, kaffie-lime leaves, and sweet basil leaves. A discretionary service charge of 12.5% will be automatically added to you bill.